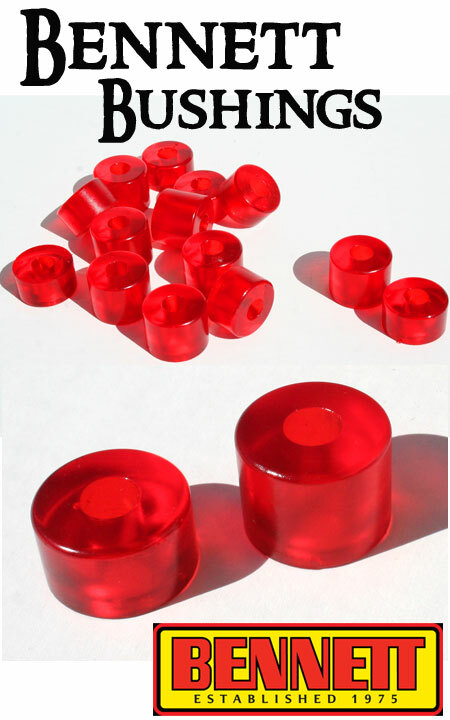 Genuine Bennett replacement bushing set in 90a durometer clear red urethane. Perfectly sized to fit the Bennett Vector Trucks (4.3, 5.0 and 6.0 hanger sizes). Two pieces - top and bottom barrel style bushings - enough for one truck. ABOUT BENNETT TRUKS: In 1975 Mr. Bennett made skateboard history with the introduction of the very first trucks made specifically for a skateboard. Known for their Big Red Rubbers ™, precision components and amazing turning ability, Bennett Truks ™ quickly became the choice of most professional and amateur skateboarders. With superior geometry enabling hard carving and tight snappy turns, Bennett's 70s issues are still on the cutting edge of performance. Over the years many have copied Bennett's legendary designs and features, but none have ever been able to duplicate the feel or performance. Bennett has reintroduced their iconic Vector ™ truks, while finalizing the development of the next generation of precision Bennett truks and wheels. (Courtesy Bennett Truks web site). Bennett headquarters located in Southern California.